Summary from Christianbook.com: When her mother passes away, Ella's forced to auction off her family's farm. Her father died years ago, and she could never manage the fifty acres on her own. But after she moves to town, she can't deny the pain she feels watching the new owner, Loyal Weaver, repairing her family's old farmhouse-everything Ella had once dreamed of doing. What Ella doesn't know is that Loyal secretly hopes she will occupy this house again . . . as his wife. He begins inviting her over, to ask her opinion on changes he wants to make. As their friendship blooms, Ella starts to wonder about Loyal's intentions, especially when her best friend, Dorothy, hints that Loyal is not who he seems. There's no way the golden boy of their close-knit Amish community could be interested in Ella, long the wallflower, hidden away caring for her ailing parents. Summary from BN.com: "But Mother is always dying," is Gillian Ormsby's sarcastic response when her younger, favored sister tells her that she has to go take care of their hypochondriac mother. Much against her will, since she and her mother never have gotten along, Gillian arrives in California to find the garden and yard dead, the blinds all drawn, and her mother indeed in bed—waiting to die. But when Gillian talks with the doctor, he assures her there's no medical reason behind her mother's state. 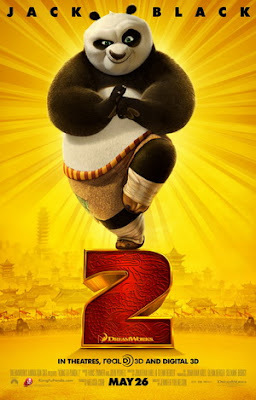 Movie Review: "Kung Fu Panda 2"
It's been awhile since I've been to theater. After the Best Picture Showcase where I spent over 12 hours watching movies straight, I was kinda theater tapped out. Plus there hadn't been anything coming out lately that I absolutely had to see. Kung Fu Panda 2 was one that I was excited about but due to trying to conserve funds, I figured that I could wait until it came out on DVD. But then as luck would have it, I had gotten a coupon for a free large popcorn AND a large drink and a GC with about 3 bucks on it. If I went during the early matinee shows, that means I only had to spend $3 bucks on my whole outing. Also my sister had gone to see KFP2 and told me she bawled while watching. Since the two of us tend to cry at the same movie, that totally sold me on going. Yes, I love a good cryfest at the theater. Summary from BN.com: Lucas Vermontez was a proud firefighter like his father. Now, not only has he lost his father and his best friend, Zach, in the fire at the Grove Street homeless shelter, but the devoted rookie can no longer do the work he loves after being crippled in the tragic event. When friendship with his buddy’s beautiful widow turns into more, he wonders, what could he possibly offer Jenna? Jenna Morgan is trying to grieve her husband’s death like a proper widow, but the truth is, she never really loved Zach. His death feels more like a relief to her. But that relief is short-lived when she loses her home and the financial support of her in-laws. Now the secrets of her past threaten to destroy her future. Can the two forget the painful past and discover new reasons to live and love? Summary from the publisher: Holden Harris is locked in a prison of autism, bullied by kids who don’t understand his quiet, quirky ways. Ella Reynolds, star of the school drama production takes an interest in Holden after she catches him listening to her rehearse for the school play. Will friendship, faith, and the power of song be enough to unlock the miracle that Holden needs? If you've ever read a Karen Kingsbury book then you know what to expect when you read this book. If you've never read a Karen Kingsbury book before, well all I have to say is that it's like reading a soap opera. I'm not saying there's anything wrong with soap operas but there's as much drama in this book as you find on daytime TV. Of course it's a Christian soap opera. Summary from BN.com: In Brussels at the height of WWI, a small, underground newspaper is the only thing offering the occupied city hope—and real news of the war. The paper may be a small whisper amid the shouts of the German army, but Edward Kirkland will do anything to keep it in print. Meanwhile, Isa Lassone, a Belgian-American socialite whose parents whisked her to safety at the start of the war, sneaks back into the country to rescue those dearest to her: Edward and his mother. But Edward refuses to go, and soon Isa is drawn into his secret life printing the newspaper . . . And into his heart. Summary from BN.com: Lucky Quinn writes up weddings for one of the hottest bridal magazines. And it wasn’t easy to get there. From humble beginnings, she outsmarted her way into the center of New York’s glamorous magazine industry – making up for her background with a sharp mind, whip-thin physique, and ceaseless ambition. Summary from Christianbook.com: Madison Van Buren is fed up with Ivy League pressure, her parents' marital problems, and her boyfriend's neglect. So she hops in her car and drives west. Meanwhile, 18-year-old Anna Bronner wants to escape her tedious "simple" life. What will happen when a Manhattan socialite and an Amish girl switch places for a week? If you have been reading my reviews for a while, then you know how much of a fan of Melody Carlson I am. I've read about 99% of all her adult and YA books and have been thrilled with almost all of them. She is one of those authors that I love to recommend, to both readers of Christian and general market fiction. I pretty much think she can do no wrong in terms of writing. That is until I read this book. Summary from BN.com: Marissa Rogers never wanted to be an alpha; beta suited her just fine. Taking charge without taking credit had always paid off: vaulting her to senior editor at a glossy magazine; keeping the peace with her critical, weight-obsessed mother; and enjoying the benefits of being best friends with gorgeous, charismatic, absolutely alpha Julia Ferrar. Congrats to the winners of Cut by Patricia McCormick! Well it finally has happened. After almost 5 years of completing every one of Katrina's reading challenges, I have failed to complete this one. Out of the 49 books I said I was going to read during this challenge, I failed to read 8 of them. I can explain this. The books I chose were the books I had scheduled to read for review back in March when the challenge started. I thought that I would be able to read all the books in time since they were scheduled to be reviewed. What I didn't count on was all the other review books that would come in during that time that needed to be reviewed before reading all those books, ie blog tours. That being said, I did read an additional 35 books bringing my final total to 76 books in 3 months.These books were either additional review books, books I owned or the scant few that I did check out from the library. Summary from Amazon.com: Clark Shealy is a bail bondsman with the ultimate bounty on the line: his wife’s life. He has forty-eight hours to find an Indian professor in possession of the Abacus Algorithm—an equation so powerful it could crack all Internet encryption. Summary from BN.com: At the dawn of the First World War, the French provincial village of Briecourt is isolated from the battles, but the century-old feud between the Toussaints and the de Colvilles still rages in the streets. When the German army sweeps in to occupy the town, families on both sides of the feud must work together to protect stragglers caught behind enemy lines. Summary from BN.com: Love and second chances aren't easy to come by in a town named Tombstone. When Christy Grey receives an urgent summons to Tombstone, Arizona, she reluctantly leaves her new life in California. The trip goes from bad to worse when three masked men hold up Christy's stage. She finally arrives in Tombstone to find her mother ill and her brother trapped in a life of gambling. Desperate for money to support her family, will Christy bow to pressure from the local saloon owners and return to the life she thought she'd given up for good? Nevada Keene has problems of his own. He's been dodging bullets for years and wants nothing more than to settle down and get married. But he's on the run from outlaws bent on revenge, and the one woman who captures his interest recognizes him from the stagecoach holdup. Will Christy turn Nevada in to the authorities, or will the outlaws on his trail catch him first? Summary from BN.com: Kimberly Tucker's life hasn't turned out the way she thought it would. A divorced mother of two, Kim resents her ex-husband for moving on with his life and living it up while she struggles to understand what went wrong. When her sons end up spending five weeks of summer vacation with their father, Kim's own father suggests a respite in the family vacation home on tiny Cedar Key Island. As Kim revisits her childhood memories and loves, she soon discovers that treasures in life are often buried, and mistakes—both past and present—become redeemable in God's hand. Summary from BN.com: Ever wish you could let the world know just what you think of your ex? Thanks to SlateYourDate.com, Dan Davis has discovered that long after he's dumped them, ex- after ex-girlfriend is dumping on him-all over the Internet. And it's ruining his dating life. Faced with the prospect of a lifetime of singledom, Dan must track down his many exes in order to put things right. Along the way, he discovers he has much to learn about himself. Particularly when he meets up again with Polly-and realizes he wants her back. Can Dan convince his former love he's changed? Can his friend Ed convince him he needs to change in the first place? And can the two friends use their newfound knowledge to help other men in the same boat?